Polypore expert L. O. Overholts (1953) calls Trichaptum sector the "tropical analogue" of the widely distributed and common North-temperate species Trichaptum biforme; in subtropical and tropical areas of North America, Trichaptum sector takes over as the ubiquitous, hardwood-decomposing little polypore (in the United States, this means the mushroom can be found along the Gulf Coast and in the southeastern states). 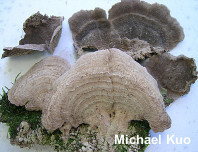 The hairy upper surface of Trichaptum sector features zones of whitish, yellowish, pale cinnamon, and grayish shades--but its pore surface is gray to purplish brown or almost black, leading to potential confusion with Bjerkandera adusta (which has much tinier pores and differs microscopically). Thanks to the Field Museum of Natural History in Chicago for facilitating study of the specimen cited below. Ecology: Saprobic on the deadwood of hardwoods; causing a white rot; growing alone or gregariously, often in overlapping clusters; annual; appearing year-round; widely distributed in Mexico and found in the United States from eastern Texas to North Carolina. The illustrated and described collections are from Texas. Cap: Up to 9 cm across and 5 mm thick; more or less semicircular, irregularly bracket-shaped, or kidney-shaped; flattened-convex; velvety to hairy; with zones of whitish, yellowish, pale cinnamon or grayish. Pore Surface: Gray to purplish brown or nearly black; with 3–6 angular pores per mm; often eroding and developing spines or teeth with maturity; not bruising; tubes about 1 mm deep. Flesh: Whitish to grayish above, but darker near the tubes; tough. Microscopic Features: Spores 6–7 x 2–2.5 µm; cylindric; smooth; hyaline in KOH; inamyloid. Cystidia up to 20 x 7 µm; clavate to more or less fusiform; apically encrusted. Hyphal system trimitic; skeletal hyphae 3–7 µm wide, smooth, thick-walled, hyaline to faintly ochraceous in KOH; generative hyphae 4–6 µm wide, thin-walled, smooth; binding hyphae contorted, branched, 1–2 µm wide. Clamp connections present. REFERENCES: (Ehrenberg, 1820) Kreisel, 1971. (Fries, 1821; Saccardo, 1888; Overholts, 1953; Gilbertson & Ryvarden, 1987.) Herb. F C0205423F.